Columbia's got the ultimate performance tee on tap with their Coolest Cool Short Sleeve Tee, regulating temperature and moisture to keep you feeling and performing at your best. Columbia &apos;s got the ultimate performance tee on tap with their Coolest Cool Short Sleeve Tee, regulating temperature and moisture to keep you feeling and performing at your best. Omni-Freeze ZERO fabrication lowers the material&apos;s temperature. Omni-Wicking pinhole mesh at upper back, under arms, and at side torso transmits sweat away from your body to keep you dry and comfortable. 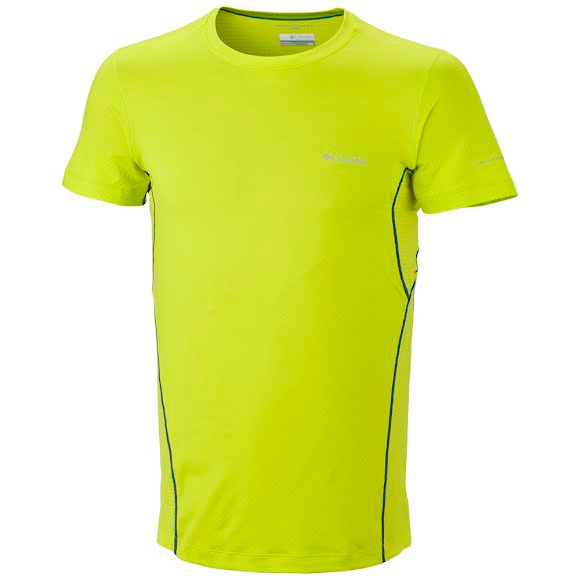 Omni-Shade UPF 50 provides premium protection from the sun. Omni-Freeze consists of specially shaped flat yarns that facilitate the release of heat, and feel cooler to the touch, during warm weather and active outdoor adventures. The specifically shaped yarns, when woven or knit together, create Omni-Freeze, which transfers heat from a surface at a faster rate than traditional fabric. The Omni-Freeze flat yarns increase the surface area of the fabric that contacts your bare skin, which transmits heat faster and feels cooler to the touch.